This 3 Day Individual Horsemanship Clinic will focus on review of previous training of a Paso Fino Stallion that was in training at KAH a few years back. As with any training, if you don't maintain the level of training you have achieved, eventually your horse will revert to their old way of doing things. This sometimes means ignoring your request or becoming agitated with your cues. While you may have previously experienced the pleasure of a very well trained horse, the trainer cannot transfer his skills and knowledge about your new horse.... you will have to learn as much as you can about your new companion before setting out your next trail riding or showing adventure. 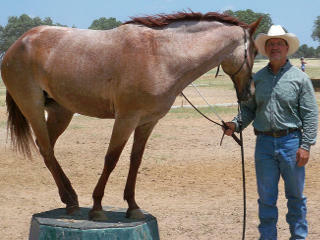 I will take the owner through every step necessary to get their horse back to his previous level of training. Please log in or create your account to add to cart.